Turi Fiorito has been appointed as new Director of the European Federation of Inland Ports (EFIP). He will take up his function on 20 August, 2018. Turi Fiorito comes with a solid background in EU policy making and transport, having worked as Transport Policy Advisor for a Dutch Member of the European Parliament, Wim van de Camp. In that capacity, Turi has been working on different port (Port Services Regulation), rail (4th railway package) and inland waterway issues for a number of years. 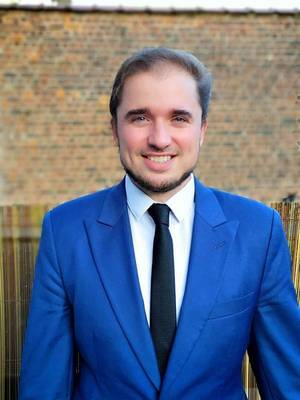 Before joining the European Parliament, Turi worked as a European Affairs Assistant at the Dutch Airline company KLM and started his career as a Consultant for a global public affairs consultancy, based in Brussels. Turi studied history and international relations at the University of Nijmegen and Utrecht (Netherlands). He then pursued a Student Affairs Fellowship at the National Chengchi University in Taipei (Taiwan). "I very much welcome Turi on board of our organisation", says EFIP President Roland Hoerner. "With his experience in EU policy making combined with his knowledge of EU Transport policy, EFIP is again in good hands. I am convinced that he is the appropriate person to voice our views on EU policy making in this crucial period, where important files such as the new Connecting Europe Facility have to be discussed. On behalf of all EFIP members, I wish Turi a lot of success in this new function." "I am excited to start representing the EFIP Members in Europe on the policy topics in addition to expanding their visibility in Brussels and beyond" says Turi Fiorito. "In the next few years, we will not only be faced with policy revisions, such as CEF and the TEN-T, but also with the changing of the European Institutions. This will provide EFIP with a plethora of opportunities and challenges that I look forward to addressing alongside the existing team." "I am looking forward to working with Turi and strengthening further the cooperation between EFIP and ESPO in the interest of both organisations. Inland and sea ports are both nodes of transport which face similar challenges on issues like financing of infrastructure investments, decarbonisation, digitalisation and port-city relations. I hope we can step up the exchange of experience and best practices and benefit as much as possible from being under one roof", adds ESPO's Secretary General Isabelle Ryckbost. EFIP has a joined office with ESPO since 2009. T. Fiorito succeeds Alexander van den Bosch who took up a new position as Senior Advisor for the 12 Dutch Provinces Representation.